Exploring new places is fun. Embracing change is great. We love a lot of the recent changes that have been made – and are being made – to Fethiye at the moment (okay, there’s a couple of dubious topiary placements in the new Fethiye town square but we’ll get over it) and have sampled many of the new restaurants, such as Shaka, along the harbour. But familiarity is also a necessity in life. We enjoy the comfort and reassurance provided by the Fethiye institutions; those businesses that plod on, regardless of all that is happening around them, serving up the same food and drink they’ve always done and more than holding their own in customer numbers. They may have branched out and opened a second establishment, but Yengen Burger is one such place. And another much loved place in Fethiye, and the subject of today’s post, is Hello Büfe. It’s just unthinkable that Hello Büfe could not be there as you stroll along Fethiye harbour. It’s been here for as long as we can remember, anyway, and during opening hours, we’ve never once seen it empty. It’s a continuous stream of customers and waiters dodging people on push bikes as they carry trays filled with glasses of çay. Because çay is the tipple of choice here. 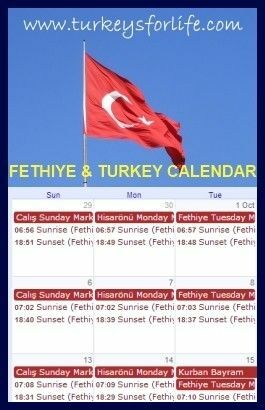 You can get an Efes Pilsen or a soft drink – and some people do – but the majority of Fethiye folks, including us, come here to drink çay. Hello Büfe lines the harbour and even has a covered terrace that juts out into the bay. But this is no swanky seafront restaurant. There are no airs and graces here. It’s a büfe. You sit yourself down for çay (you might even have to shout to grab the waiter’s attention) and, if you’re hungry, a simit, tost or a poğaça. Tea and snack. That’s what you come to Hello Büfe for. It’s cheap! Oh, but there’s another attraction to Hello Büfe, too. It’s also a little kiosk where passers-by stop off to buy a water, a pack of cigarettes or a loaf of bread. Customers of Hello Büfe also buy the bread – they buy it to tear off chunks and throw into the sea. It makes for an entertaining glass of çay. In wintertime, the seagulls catch most of the bread mid-air before it even hits the water, but just under the surface of the water (and many times above the surface) are huge shoals of grey mullet. No one is allowed to catch fish here, but there are lots of eager customers waiting to feed the fish, and it appears the mullet have caught wind of that fact. Sitting at Hello Büfe is an experience! It’s also very pleasant. As we were walking up to Deep Blue Bar last Saturday evening, we bumped into one of the owners en route. He stops at Hello Büfe for çay before he takes on the Saturday night crowds of Paspatur. As we were all heading in the same direction, we sat down for çay, too. Well, how could we resist? Wouldn’t you like to sit here for pre-night-out çay? Sounds lovely.Another place on my list to stop at.Thanks. Very creative photos. Most of all, I like your “cup of tea”. Nice photo. That looks fantastic, a perfect environment to drink çay, I would love to stop by Hello Bufe!